Each spring, as leaves unfold and pastures green, cyclists return to Upper Valley roadways. I have come to expect this — brightly colored jerseys on quiet wheels â€“ as I do natural seasonal phenomena. I take pleasure in observing the single rider far from home, the little cluster chatting as they pedal, the parent and child climbing the hill. I am glad to live in a place where human beings can move through the world on bikes. Thereâ€™s probably no more profound influence on Upper Valley cycling than the Prouty, an annual bike ride and fundraiser for the Norris Cotton Cancer Center. Last year, over 5000 participants, 1250 volunteers and 122 businesses raised over $2.5 million to fund cancer research and patient care. But the story of the ride goes back to 1982 when four nurses cycled 100 miles to honor the courage and strength of their patient Audrey Prouty. The Prouty grew as families and friends formed teams to ride for those they loved. People borrowed bikes. They practiced riding 20, 35 and 50-mile loops. Bike shops and local businesses promoted the Prouty. The Prouty became a centering point for reunions and memorial activities. Â Now it is truly a community event. Â Since that first bike ride, the Prouty has raised more than $14 million for research into ways to better diagnose, treat and prevent cancer and helping to ease the way for patients and families struggling with cancer. Â Donors to the Prouty help patients in northern New England and make a difference in the lives of patients all over the world. 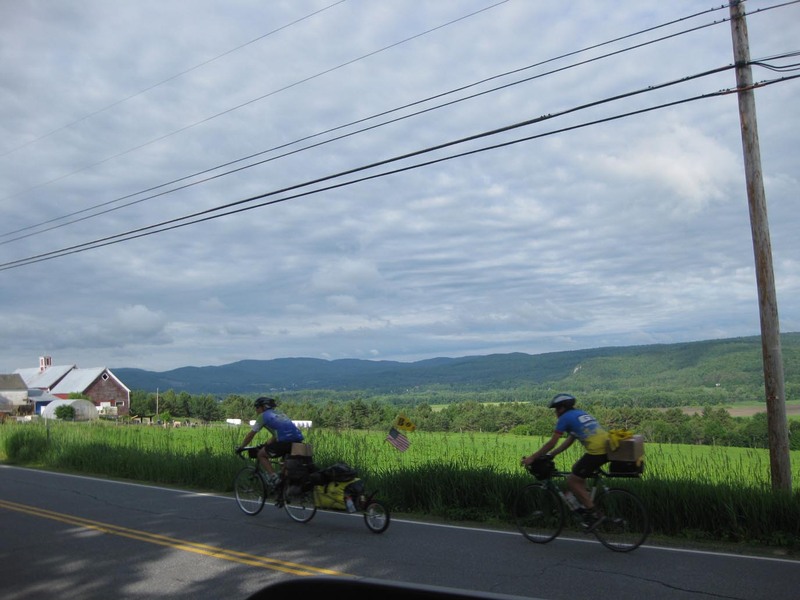 Cyclists on Route 10 in Piermont, NH overlook UVLT conserved Winsome Farm and half a dozen other visible protected properties along both sides of the Connecticut River valley. This view is along the 77-mile Prouty route this year. On Prouty Day 2013, UVLT will proudly post our yellow signs on the nearly 50 parcels of conserved land that lie along the cycling routes. We honor and remember friends and neighbors, landowners and volunteers, doctors, researchers, care providersâ€¦ and people, who like the four nurses, plant a seed. We gladly join in celebration and strength.